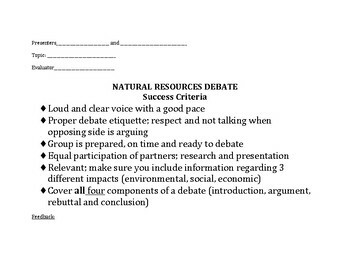 This is a copy of success criteria used for a debate on "Which natural resource should be used for energy generation in Canada?". I designed the debates to be argued between 2 resources, and each had to determine why their resources was a more suitable choice for energy generation in Canada. I will have the full assignment ready and up in my store soon.